Camp was deployed in the dark. The goal is to be up early and head to Hayden Valley to find what the fuss was all about last night. 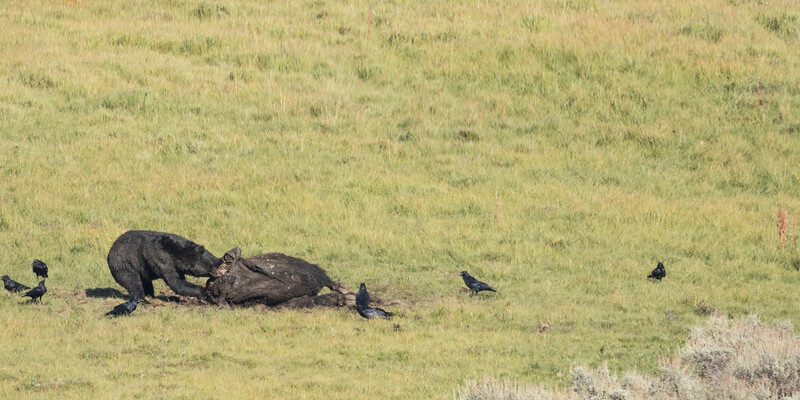 It turns out that there is a relatively fresh bison carcass out towards the river, east of the road. Unfortunately, the morning sun and fog made it for some really difficult viewing. When the fog began to clear, we could see a grizzly bear on the carcass, but the light was just too painful. So I left for some breakfast. The hike today was to Wolf Lake; uneventful. Shower. Nap. Dinner. Back at the carcass location for the evening. There is such a crowd here, it’s best to park it for the evening and avoid the pain of trying to move around. The bear was around all day, sleeping and eating. This bear is pretty large. After studying the photos, I’m almost sure it’s the same one from last year’s LeHardy Rapids carcass. 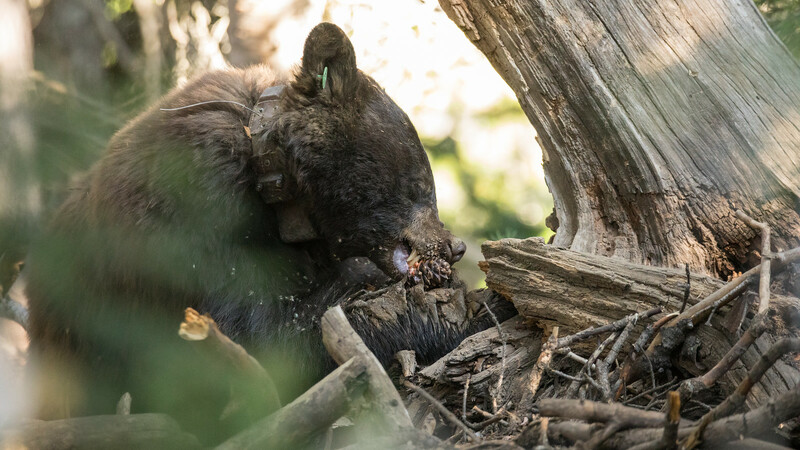 Anyways, the large bear was sleeping close to the carcass when another bear approached. The sleeping bear was sort of in the sage so hard to see until it was too late. The approaching bear looked to be too small to take over the carcass, but the larger bear chased him off anyway. 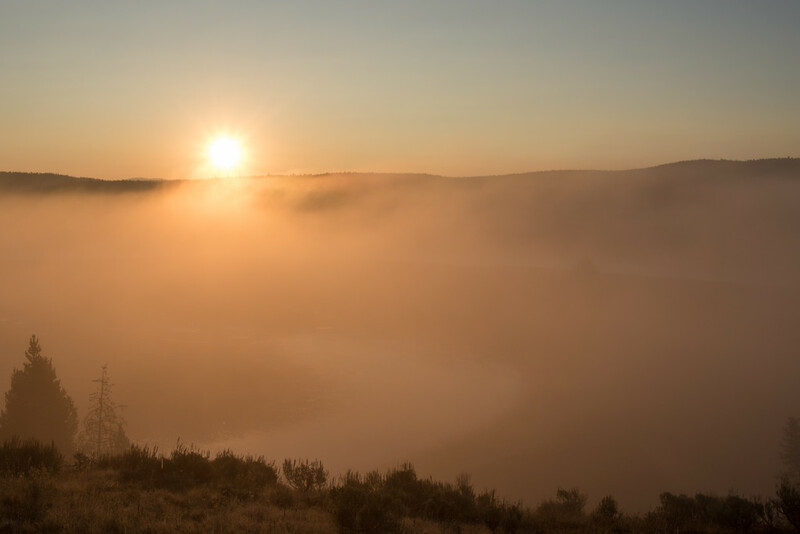 Expecting another foggy morning in Hayden Valley, I instead spent it higher around Dunraven Pass. It should be whitebark pine season with black bears and Clark’s nutcrackers around. 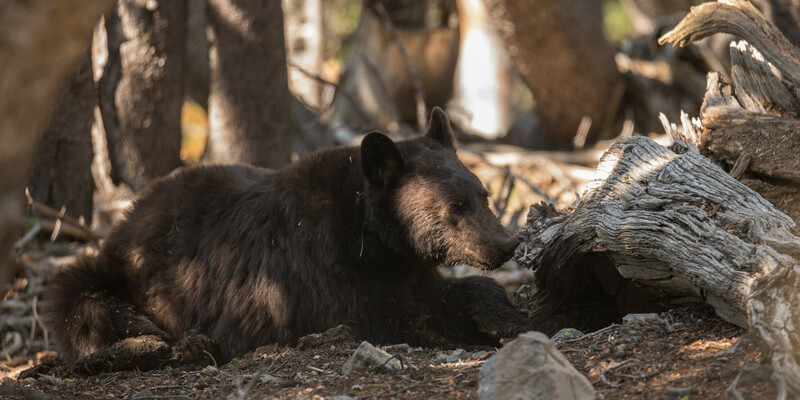 After enjoying the smoky sunrise, there was a bear jam close to the Dunraven trailhead. But they were looking clear across the valley! True, there did seem to be a black bear up a tree, but it’s just a dot through a scope at that distance. We can do better. So it’s up my most frequented trail in the park: Dunraven trailhead up to the Mt Washburn firetower. 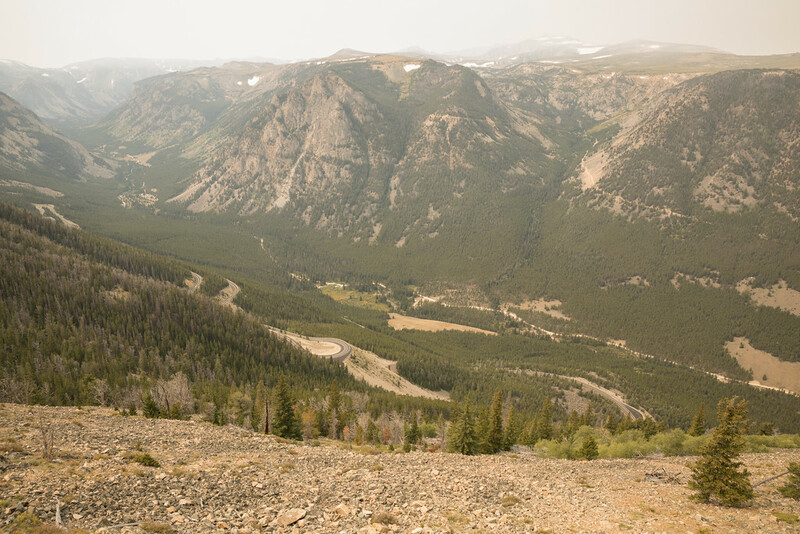 The trail has snow through June, wildflowers through July/August, and bears through September. Hiking it throughout the summer season is almost always a different experience. Sure enough, there were a couple bears in the area, mostly raiding squirrel caches and not so much in the trees. It’s worth noting that the bears will head straight up and down the mountainsides, while the trail is a switchback pattern in this area. So a human and bear can cross paths multiple times. 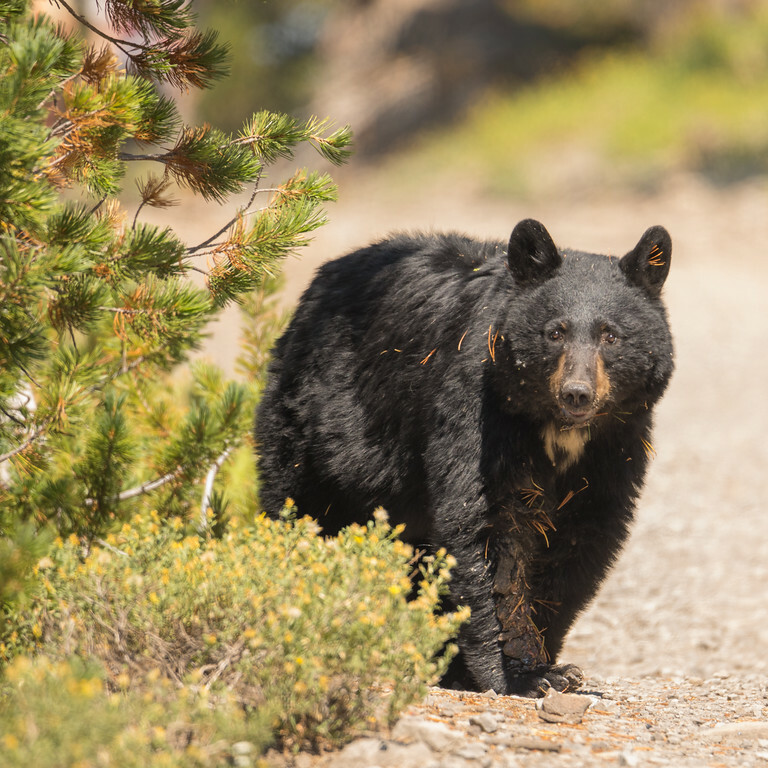 It also means that it can more common for a bear to appear suddenly from behind a bush/boulder rather than being seen approaching on the trail. After seeing the second bear on the way up, I started asking oncoming hikers about any sightings (as well as giving my report). One guy in-particular responded with “oh, there are no bears in this area of the park.” (!!) It didn’t take long to change his mind after showing a few pictures on my camera and pointing to where the last bear was seen. After a quick reminder to always be bear aware, we both moved on. On the way back down, I approached an oncoming hiker. As he got closer, I noticed that his bear spray was out and pointed towards me. “You’re making me nervous with that thing,” I said. 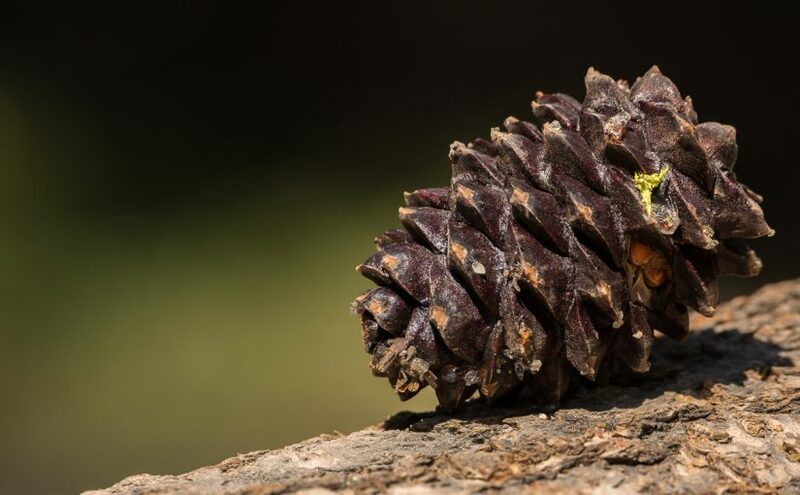 He said that a bear was following me on the trail, but when I turned around, the bear was in the trees again, finding more pine cones. That evening was back at the carcass. The bear didn’t stir until after everything was in shadow, so no photos. However, the Wapiti wolves ended up stealing the show that evening – all 17 of them! After many failed attempts to count them, I put the scope in one spot and let them pass by. I took a video, although it was dark, and YouTube’s compression almost makes some of them un-see-able. Anyways, see if you can find all 17. I’ll give you a hint in that there are two grays in front of the white at the very beginning. The morning was on Dunraven Pass again to watch the sunrise. It’s smoke was especially thick this morning. Today I was a little tired, so no hikes. I drove all the way to Red Lodge, enjoying the hazy sights along the way. Got back to Canyon in the early afternoon. Shower. Nap. Dinner. The evening was back in Hayden Valley. The sun was fading out early from the smoke, and the larger bear showed up at the final moments of light. More interestingly, a second bear showed up, but it saw the other one at the carcass and stayed at a distance. The light faded with the approaching bear never crossing the river. Back to work today, packing up camp at 4:30am to make it to Wilson by 9am with time to take some photos along the way. There really weren’t that many stopping moments though with all the haze. Even Oxbow Bend was uninteresting with Moran almost invisible and everything else still mostly green.